If you have ever been to Squirrel Camp, you know that it attracts a group of hard working, incredibly athletic and borderline nuts (ha!) individuals. No event showcases all of these traits quite as completely as the Kluane to Chilkat International Bike Relay. This year the Squirrel Camp team was stacked with a whole three regular bikers, and five members who may or may not have seen a bike in the past year. The 8-person team and its two cheerleaders rolled up to the bike race in homemade T-shirts, hanging out of a massive F-250 complete with a sign. Clearly, we were ready to crush and wow the competition with our incredible speed and our amazing cheers. Our first biker exploded off of the start, putting Squirrel Camp decisively in the middle of the pack. The cheer squad was less confident. At first we were unsure of our cheering style. Would we just scream loudly? Would we say good job and clap? Would we throw our hands into the air and fist pump? All of our indecision was resolved when the man parked in front of us pulled a mysterious wooden box from the back of his truck. From this box he removed a glorious, magical instrument…bagpipes. With these he serenaded the first few bikers to the delights of the cheering crowd and bikers alike. Now the Squirrelers knew how we would cheers…we would dance! For the next eight legs, as we passed through one time zone, a territory, a province and a state, and the scenery graded from mountains to alpine to Alaskan rainforest our dance moves evolved. Our cheers where no longer reserved for just our team. Along the way we picked a few lucky bikers to gift with our incredibly uplifting cheers. Their confused expressions just made us cheer louder and da nce and bounce around more fiercely. 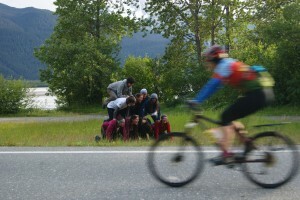 As we arrived in Alaska and the last leg, we had reached the height of our cheering potential. Now we were truly creative. As I had the last leg I was lucky enough to have a bikers view of these glorious Squirrelers. 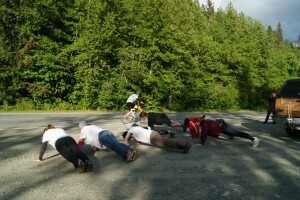 As I rode by the team the first time I was greeted with a line of Squirrelers doing pushups…sort of. The second time around was a human pyramid of epic squirrely proportions. If there had been a team spirit award we would have won hands down. However, awards where only given based on speed. We came in very close, getting 61st out of….65. GO SQUIRRELERS! Not bad for a bunch of crazy bush people!